BOERNE, Texas - One of the first things anyone ever learns about Texans is that here, they like their space - and their great outdoors, especially around the Hill Country in Central Texas. Just over a decade old, the Cordillera Ranch master-planned community is set on 8,700 scenic acres and offers a city escape in the thick of the Hill Country, minutes north from San Antonio in Boerne and about a 90-minute drive southwest of Austin. The development has thrived over the years thanks in part to its emphasis on being active. 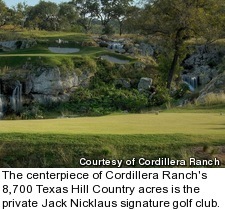 That includes not only the new Jack Nicklaus signature golf course at Cordillera Ranch that opened in 2007, but seven recreational clubs total offering everything from kayaking and fishing on the Guadalupe River (the Guadalupe State Park is nearby) to sporting clay shooting. "At Cordillera Ranch, we wanted to provide a place that had everything Texans love to do outdoors," said Chris Hill, vice president of Cordillera Ranch. 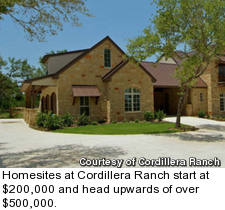 Since Cordillera Ranch was founded, about half of the 2,200 eventual homesites have been sold. Homesites start at $200,000 and head upwards of over $500,000 and 10 acres. There will be 125 sites with golf course frontage, but they will all be set well off the golf course. You can do these kinds of things when you have 8,700 acres. 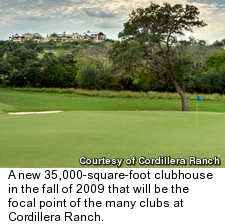 In its present form, it would be hard to believe that nearly the first decade of Cordillera Ranch had no golf to speak of, but it has splashed onto the scene in a big way with the private Jack Nicklaus signature golf course, which opened in 2006. While many of the greens are smaller than your average Nicklaus greens at resort courses, most of them have slopes off of them that a player can play into, and thanks to such tight fairways and fringes, balls will funnel onto the green, like on the par-4 10th and 18th holes especially. The staff noted that putts tend to break towards the Guadalupe River Basin to the north and the Two Sisters Peaks, so stay aware of your surroundings. Skilled players will appreciate these design subtleties that will mean the course can be played a variety of ways, but everyone's jaw will drop at the signature par-3 16th hole, a Hill Country marvel, featuring a green sitting atop a 40-foot canyon wall with waterfalls. The golf club also features a full practice facility including multiple putting and chipping areas, as well as two full practice holes. To date, 350 of the 400 golf memberships have been sold. The newest addition to the Cordillera Ranch is a new 35,000-square-foot clubhouse that sits overlooking the golf course and offers views miles beyond. Next to the dining room, an outdoor fire pit is a popular spot to have a post-round cocktail and gaze out up to 25 miles long at the Guadalupe River basin and Hill Country. The clubhouse was built by Marsh & Associates so as to function more like a town square than one building. Three Hill Country-style buildings built with thick stone and wood are connected with outdoor walkways. Inside is everything from day care to a fitness center and a spa staff offering a full menu of treatments. The locker rooms, accessible from the golf club and fitness center, are a place you could escape to for the whole day, thanks to such amenities like a whirlpool with flat screen TV. So be sure to set your alarm for dinner. 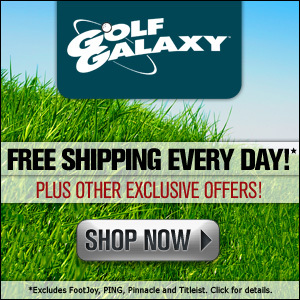 Brandon Tucker is a Senior Writer and Special Projects Editor for the WorldGolf.com Network, where he contributes not only golf and travel articles, but photo essays, videos and more. His golf travels have taken him across the U.S., including more than 50 Myrtle Beach-area golf courses, and to such destinations as Scotland, Wales, Portugal, the Czech Republic, Poland, Germany and Malaysia.